Chicanos are drawing attention to Denise Elsken — a heartless woman out of the Martinez School District that should NOT be a school board member. In fact, we are going to demand she resign forthwith for her derogatory and offensive views towards brown kids vs. her views for the affluent. Essentially Elsken believes La Junta children (high Chicano/Latino population school) shouldn’t have air conditioning but believes a school in an affluent area should be deserving of new air conditioning. I implore my reader to sign this petition (signatures already at 857) and call or email the Superintendent of the Martinez School District . See contact information below. In addition to Elsken’s resignation, we believe the superintendent of the Martinez School District via Rami Muth should apologize for Elsken’s derogatory views that are clearly unjust. The entire Martinez School District should understand and realize that the Chicano/Latino economic contributions are significant. We are a force to be reckoned with considering the U.S. Hispanic market is one of the top 10 economies in the world. We were happy to see Superintendent Joe Jaconnette apologize for their behavior and now it’s time to see Rami display leadership in the Martinez School District. Furthermore, we will be following up with La Junta School parents to see whether or not the Martinez School District opted for planting trees versus giving the school with a high Chicano / Latin children population new air conditioning. This is not the first time we have seen this sort of behavior in a northern California school district with regard to what school board members/leaders will do in order to create an unjust climate. For instance, the Orinda Union School District Superintendent Joe Jaconette was in hot water in light of his utter disregard for the concern and safety of a 7 year old little girl. According to the Mercury News: “Days before kicking a second grader out of the district for living outside its boundaries, the Orinda Union School District twice denied the Latina girl access to its free lunch program while recognizing that she lived in the city.” The absolute worst part of this story involves the mother of this precious seven year old little girl where her mother was hiding their address in light of filing a domestic violence restraining order against her ex. We implore our reader to call Rami Muth and demand an apology for Denise Elsken’s derogatory views that have no place in the school board system. This woman is not fit to be on a school board making decisions for children. She publicly displays her racism and lack of common sense. Her statement is rude, it is dehumanizing and it is patently unfair. 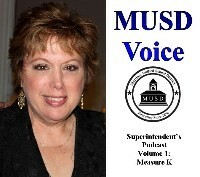 Denise Elsken is unfit for the position she is in and should be removed from her position on the school board. Martinez Unified School District getting dismal star rating grades — 2 out of 5.